@sales helps organizations to comprehend their sales opportunities and to manage their sales efforts. @sales was designed specifically for companies that sell professional services. Choose the edition that best fits the size of your company. The Personal Dashboard shows each user a quick view of their assigned Deals and Actions (tasks). Take a look at our brochure to learn more about this dashboard and the Manager's Dashboard. 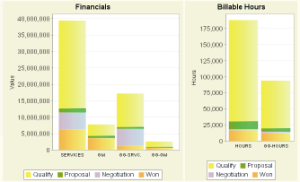 Graph 1: Financial Data by Sales Stage, Graph 2: Billable Hours by Sales Stage. Selling services is not the same as selling products. The sales tools you need are different too. Scroll down to see some of the differences for yourself. Which Deals do We Chase? You can't chase every sales opportunity. Some proposals require significant time and cost to put together. How do you evaluate all the opportunities and decide which Deals to chase? @sales will organize your sales opportunities and present the data so that you can see the whole picture. It takes time for some projects to firm up. @sales helps by allowing you to assign Go and Get probabilities to each sales opportunity. Go is the probability that the project will materialize. Get is your probability that you will win the opportunity if it is a Go. @sales will help you track any stage of opportunity and its current state. It uses Go and Get probabilities to calculate factored values for the opportunities that you are chasing. Above is a closeup of the Deal Review Screen (shown below). It shows Go and Get Factored Values for Revenue and Gross Margin for a Deal. 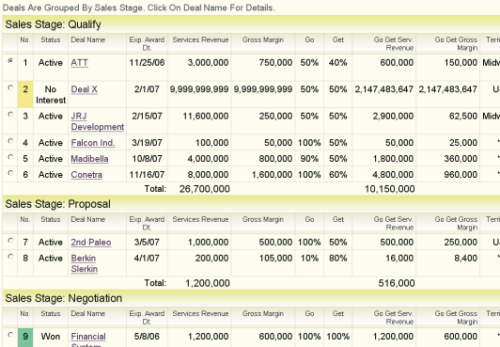 The Deal Review Screen groups Deals by Sales Stage. A green marker identifies Deals that have been won. An amber marker identifies Deals that you will decline to bid. Click on a Deal Name to popup details for the Deal. from sold and unsold Deals. 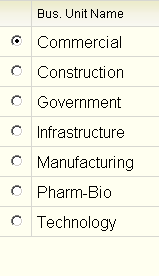 define and review Deals by Business Unit. Enterprise Edition let's you define and review Deals by Sales Territories. Businesses that sell professional services have a hungry monster that consumes billable hours. Operations managers need to understand where new projects are going to come from and when they will arrive. The Labor Pipeline shows a forecast of billable hours from sold and unsold projects (bids). The trailing edge of the curve indicates when billable hours will turn into overhead. Organizations try to keep the trailing edge of the curve as far out in the future as possible. Do you know what this curve looks like for your organization? If you do you know how hard it is to gather the data and to create it. @sales will show it to you with one click. Create Business Units (company divisions), Sales Territories and Sales Sub-Territories that fit your business. Enterprise Manager, Business Unit Manager, andTerritory Manager. 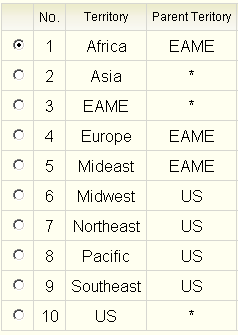 Assign Territories and Business Units to your sales force. Associate Business Unit, Sales Territory, and Executing Office to sales opportunities. Click here for information on @sales Editions and Pricing. 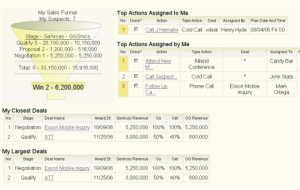 Log and track each sales opportunity. Assign value, cost, hours, probabilities, etc. Log and track phone contacts and meetings with clients. Track Planned Actions and Action Results. Report Estimated Monthly Cash Flow (revenue and net) from the Sales Pipeline by month. Shows projects won separately from factored unsold projects. Report Estimated Monthly Labor Hours from the Sales Pipeline. Also shows equivalent head count. Shows projects won separately from factored unsold projects. Copyright © 2006-2007 by ReedyRiver Group LLC. .